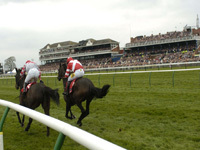 Three horses stand out now that the Flat season is up and running in the UK. This means the opening Classics of 2019 are just around the corner, along with the major meetings such as Royal Ascot and Glorious Goodwood. Many horses will be making their seasonal reappearances over the next few weeks and ahead of their opening starts of the year, here are three horses which may be worth following in 2019. Too Darn Hot was named as the Champion Two-Year Old in 2018 and there is no reason why the exciting colt won’t transfer his form into the new campaign where he is the ante-post favourite in the horse racing betting for the 2000 Guineas at Newmarket and the Derby at Epsom. John Gosden’s runner won the Solario Stakes and Champagne Stakes last season before his biggest success coming on his last start of the year in the Grade One Dewhurst Stakes at Newmarket. The son of Dubawi stretched away from his rivals in the closing stages as he had too much speed for the rest of the field. Unfortunately for those looking to back him in the 2000 Guineas, he is now as short as 6/5, however, you can still pick up 5/1 in the Derby betting. If he wins well at Newmarket next month, his odds on glory at Epsom will be slashed considerably. The three-year-old fillies division this season looks to be absolutely wide open as there is no clear favourite in the 1000 Guineas or the Oaks betting. One of the most consistent runners in 2018 was Fairyland who won four of her five races for her trainer Aidan O’Brien. Fairyland could be the latest star filly to come out of the Ballydoyle stable. O’Brien has won two of the last three runnings of the 1000 Guineas, while his record at Epsom is even better, with three of the last four renewals going his way. The biggest win of the season in 2018 for Fairyland was her victory in the Grade One Cheveley Park Stakes. Her only defeat in the campaign came in the Albany Stakes at Royal Ascot. The daughter of Kodiac isn’t the flashiest filly O’Brien has ever trained, but she could end up being his best this year. Blue Point proved he is one of the leading sprinters in the world at Royal Ascot in 2018 when he landed the King’s Stand Stakes at odds of 6/1. Charlie Appleby’s runner failed to add to his tally later in the campaign but he was third in the Nunthorpe at York. The five-year-old has already begun his season this year with three victories coming from three starts at Meydan in the UAE. Those wins suggest he is in good form and could be the sharpest of the sprinters in the King’s Stand Stakes or the Diamond Jubilee Stakes, depending on which race he enters. Connections will be expecting a big campaign from their horse in what could be his final year on the track. The next leading meeting on the flat is the Craven Meeting at Newmarket which begins on April 17.